I dig Gary Buller’s short stories, so I kind of knew what to expect going into this collection. 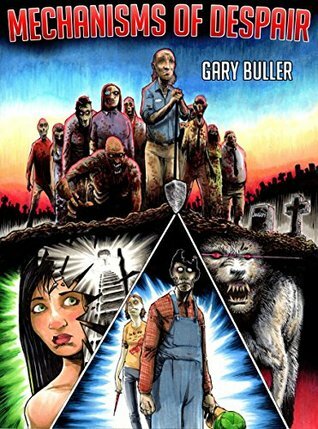 I found Gary’s writing by way of MONSTERS EXIST, an anthology that featured Wicked Congregation. He surprised the hell out of me, though. He blew my high expectations out of the water. These stories unnerve and send shivers down your spine. Gary kicks things off with The Way Out. The story is both terrifying and sad. The ending punches you right in the chest. Escape is a fun read. It’s about fringe science and its side effects. Poor Emily. The Way In is kind of linked to The Way Out. It’s about loss and struggling to cope with that loss. The Blackout is a zombie tale set in World War II London. It’s a great flash piece. Into the Fire reminds me of Texas Chainsaw Massacre for some reason. There’s a madman in an old, familiar restaurant. This story is unique and blood-curdling. The Present is about a random Christmas gift that brings more sorrow than joy. A Friend in Need is a deeply disturbing flash piece. Dog of the Dead is written by Gary’s daughter. It’s about a zombie dog. Great story! All of the stories are good! Some of the stories are better than others. Gary’s style is great–it keeps you reading. The stories grip you by the throat. They stick with you for a bit, too. They disturb. The stories run the gamut of the horror genre. MECHANISMS OF DESPAIR is a short collection that can be devoured in one sitting. That’s just the way I like it. What can I say, this collection is great. From the first story to the last, there’s not a bad story in the lot. All proceeds go to Sarcoma UK and The Alzheimer’s Foundation.